Premium Compatible Label Tapes for the Brother P-Touch 1830 printer. The Brother P-Touch 1830 printer is a sleek and versatile desktop labeler that is able to create professional quality labels for any office application. The printer measures 6.81 x 8.74 x 2.44 inches and it weighs 590g. The printer uses the TZ series of laminated tapes having widths up to 3/4 inch. The laminate is resistant to liquids so the integrity of the labels will not be compromised by water, oils or chemicals. It also has the ability to print on a super narrow non-laminated tape which is perfect for labeling CD spines. The printer is able to print in 4 type sizes and 9 type styles. It features in built templates for easy labeling and also has text framing, underlying features. A 15-character LCD display is provided for easier viewing and editing of the text. The printer uses thermal transfer technology for printing on Brother P-Touch 1830 label tapes. The print resolution is 180 dpi and the print speed is 10 mm / sec. The printer also features 5 favorite keys that allows one to save the favorite phrases into the memory. And later on print them out with only one touch of a button. The Brother P-Touch 1830 has a modern and sleek design with additional features such as inbuilt templates, 2 line printing, reprinting. 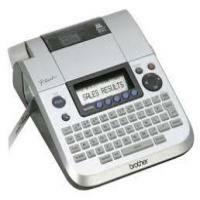 It uses laminated Brother P-Touch 1830 label tapes to produce quality, durable labels. However, each label cuts off a decent amount of blank tape as waste, for every label that one prints. Q. How do I alter the length of the labels using my Brother P-Touch 1830 machine? Q. As soon as I press the print function, the printer turns off automatically. Why is this happening? For your information I use Brother P-Touch 1830 labelling machine. A. This happens only when the batteries have gone empty or are running low. Please install six new AA-size alkaline batteries (LR6) to fix the issue. Ensure to install the batteries with their poles placed in the right direction. Also, please replace all the six batteries together at the same time. Q. I applied the Brother P-Touch iron-on label on fabric material. But the label came out after the wash. What is wrong? Are the Brother P-Touch 1830 label tapes of poor quality? A. The firm adhesiveness of the Brother P-Touch 1830 fabric label tapes depends on the fabric material, ironing temperature and the procedure followed. Please make sure that you iron the fabric labels according to the guidelines mentioned: Before pressing the label onto the fabric, regulate the iron temperature to a medium-high temperature (320-355 F / 160-180 C). After the required temperature is reached press the iron firmly on the label for about 15 to 30 seconds and release. All these fabrics should have a smooth surface to allow the label to adhere firmly to it. Highly elastic or stretchable materials. Please note that the problem is not caused due to the kind of Brother P-Touch 1830 label tapes used. These tapes are manufactured with high quality materials keeping the specific applications in mind. Q. How should I print labels on my Brother P-Touch 1830 using the favourite keys? A. You can print as well as save labels just by pressing the favourite keys. Five keys are available to store your favourite labels. When you need to save the label: select the label format and type the text you want to save. Then, locate one of the favourite keys, press it twice unitil ‘Save?’ appears on the LCD screen. Finally, press the ‘OK’ key. Next, while you need to print the saved label: press one of the favourite keys until ‘Print?’ appears on the LCD screen. To apply the settings, press ‘OK’ key. Now when you wish to open the saved label: just click the favourite key thrice until ‘Open?’ appears on the LCD screen and press ‘OK’ to apply the setting. This way you can use any of the favourite keys to print, save or open the stored labels whenever required. Q. Can I use the Brother P-Touch 1830 TZe label tapes in my 1230PC model? A. Yes. Brother TZe label tapes are compatible with a wide range of P-Touch printers including the 1230PC labelling machine.